Bluehost offers one of the highest Paying affiliate programs. In this post, you will learn How to Make Money With Bluehost India Affiliate Program. If you are a novice blogger then you must want to make money from your blog. However, there are various online ad networks such as Bidvertiser, Infolinks, Revenue Hits, Chitika and much more. But when it comes to making money from blogging then the one I personally recommend to all is Google AdSense. It is the best way to monetize a blog but who don’t want to make additional money other than AdSense. Another most lucrative ways to earn money is Affiliate Marketing. Do you know about Affiliate Program? Noooooo!!!!! Don’t worry let’s discuss what Affiliate Program is?? Affiliate Program is the best way of earning commission by promoting products of other company on your blog or website. Once you sign-up to an affiliate program, they will provide you a unique affiliate link. Also, they may offer you banner, link or text ads to advertise their product. Further, they will provide you code of those banners, link or text ad. Then you have to copy that code and add into your website then ads will start running on your blog at the location you placed the code. Additionally, you can promote that affiliate product with your unique affiliate link.When someone goes to your blog and click on one of those links, he will automatically they redirected to the product website. If he buys the product through your affiliate link then you will get the commission. I hope now you get an idea about affiliate marketing. If you want to know more about it, you can read my previous articles. However, there are many companies who have started an affiliate program to promote their product. Today I am going to tell you one of the highest paying Bluehost affiliate programs. If you have created a blog or website, you may hear about Bluehost. Bluehost is one of the most popular and globally recognized hosting provider companies. Nowadays the most recognized globally host providing company is Bluehost. Most of the bloggers and website owner prefer to buy hosting from Bluehost as its hosting plans are very popular. 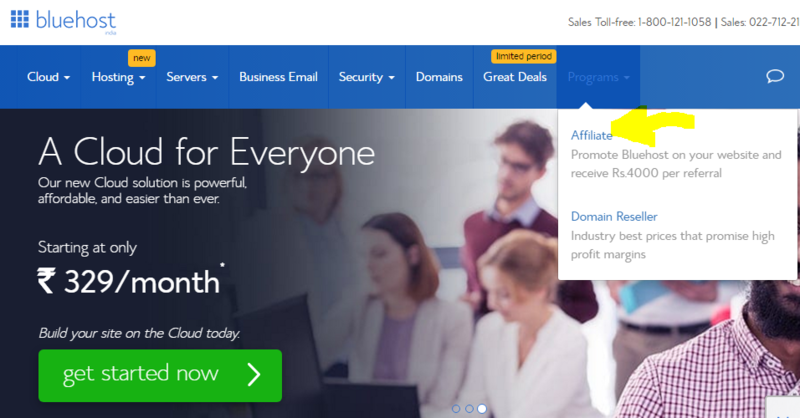 Moreover, Bluehost offers free domain name. Above all, Bluehost also offers a great affiliate program. It allows you to make a large amount of money with Bluehost India Affiliate Program. You just have to promote Bluehost on your website or blog to make money with Bluehost India Affiliate Program. When you sign-up to Bluehost India Affiliate Program, you will get an affiliate link which you can use to promote Bluehost on your website. If someone purchases Bluehost with your affiliate link, you will get RS. 4000 commission per sale. A whopping Rs.4000 commission for each successful sale. Real-Time Tracking of your earnings & performance. A wide variety of creative banners. Firstly, visit the page Bluehost and click on the Affiliate. Then you will see a sign-up form. Enter the following information in the fields. Next, enter your first & last name. In the next field, add the name of your company. Then fill your address details like city, state, country, Pin code in next fields. Add your fax number in this field; if you don’t have fax then you can leave it blank. Here enter the name of your website or blog. Choose your profession such as blogger. Now tick mark to agree to its terms & conditions. Then you will receive an email in your inbox. You will be given a password reset link to choose a new password. Click on the link. Next, you have to enter your email address and choose a new password for your account. Once you reset your password, you can log into Bluehost India Affiliate Program. Congrats, your account has created. You are ready to start earning money with Bluehost India Affiliate Program. When you log into your account, you will see Bluehost Dashboard. At the top of the dashboard, your affiliate link will be provided. Copy this link and promote Bluehost on your blog. Besides, you can promote it using the various banner or text ads. You have to select the banner & links option given at the right side of the dashboard. Then you will get the code to place those banners on your website. Copy the code and add into your website then you will their ads displaying on your website. If someone clicks on the banner or link ad and purchases Bluehost hosting then you will earn Rs.4000 commission. 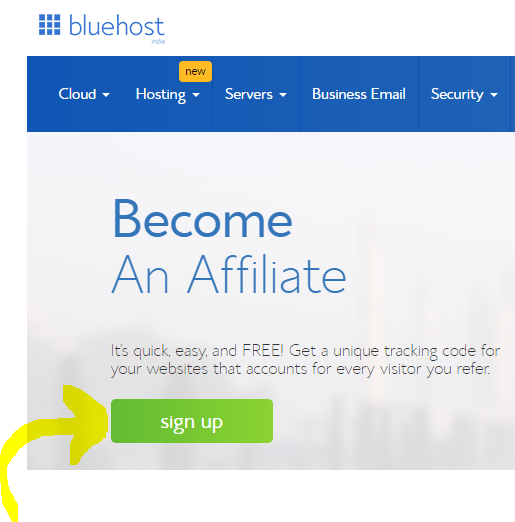 Join Bluehost Affiliate Program Now! As the recommendations of Indian developers, Bluehost is one of the best and simple web hosting platform which provide you high bandwidth and large data usage at affordable prices. Even, for my various website, I am also using Bluehost. if you are planning to buy Bluehost hosting for your blog or website. I will provide you my affiliate link, if you will buy from this link, I’ll get the commission. In conclusion, Bluehost is one of the most reputed companies. Therefore, people are more likely to purchase its hosting plans. In addition to this, it offers an affordable hosting plan, better quality, best web servers and visually appealing website. If you are thinking to promote Bluehost then you can do it without any second thought. I hope you find this article informative. If you have any query regarding this post, feel free to leave a comment below. Start promoting Bluehost & make huge money with Bluehost India Affiliate Program.